Warning: Before you start reading be aware that this is a bit of an exploratory post and so wanders a little. It is certainly making me think and I hope it will have the same effect on you. We regularly hear about the gross domestic product (or GDP) of the UK. Actually, what the press mostly reports is the net GDP growth in percentage terms. This is the GDP growth already inflation adjusted. If this number is negative for at least 2 quarters (like the UK today) then you hear we are in recession and you are getting growth if your GDP is positive. For the Average Joe on the street though I think this number may be a little meaningless and certainly isn’t as important as GDP per capita which just doesn’t seem to ever be discussed in the media or by government. The rationale behind this thought is that GDP does not take into account the change in a countries population nor the size of the population generating that GDP. - According to the CIA World Factbook, the UK population has grown by 1.1% in the last 2 years. This means you would have to see 0.5% net GDP growth per annum in percentage terms just to stand still in terms of economic output per person. - We hear that China is now number 2 and the UK is number 7 with respect to GDP. So what? They have a population of 1.3 billion compared to the UK’s 63 million. - By not correcting for population you also can’t compare how your country is doing with respect to another country. 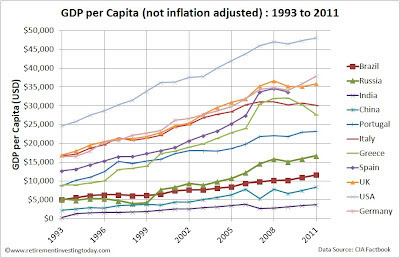 If you are growing 1% from a high GDP per capita basis and another country is growing at 10% from a low GDP per capita basis is it really the end of the world for you? I don’t think it is. Before we move on I must highlight that the rules say that GDP per capita is not a measurement of standard of living and it is not a measure of personal income. I however can’t see how there can’t be a loose correlation for the Average Joe. How can the average person not benefit from an increase in economic production per person? Let’s now run a case study. We are always hearing about the BRIC countries (Brazil, Russia, India, China) that are the rapidly developing economies, which should mean their GDP per capita is increasing at a fast rate leading to rapid standard of living improvement. We also hear of the PIGS (Portugal, Italy, Greece, Spain) which has come to represent those European countries facing financial crisis which could represent a rapid decline in standard of living. Some might extend this to PIIGS, which then includes Ireland however I won’t do that today. 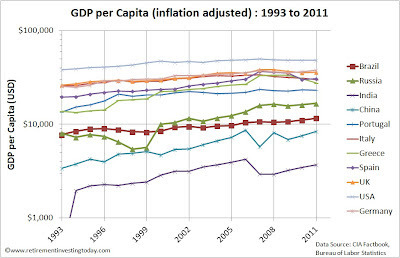 But are the BRIC’s doing better than us and the PIGS suffering? 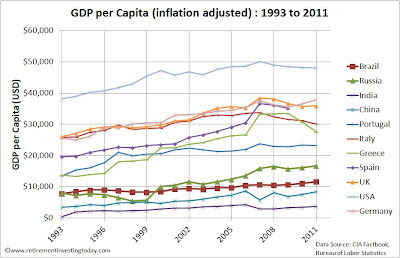 To try and get a feel for this I have looked through old issues of the CIA Factbook to find the GDP’s per capita of the BRIC/PIGS countries and compared them to the UK, USA and the “economic power house” that is Germany. The CIA Factbook prices GDP per capita for every country in US dollars (USD) which is beneficial because it means that in theory we can directly compare the standard of living of the Average Joe’s in every country. (Note that of course this is dependent on the exchange rates being a ‘true’ rate of exchange for similar goods/services which is not always the case however it’s the best I can do for this comparison). 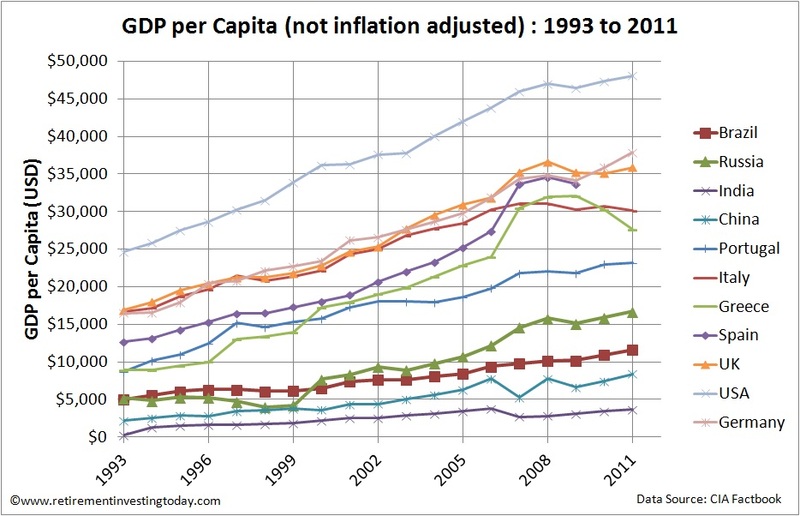 My first chart today shows all these countries GDP per capita however this does not tell the full story as $1 today doesn’t buy as much as it did in 1993. I’ve therefore adjusted for the inflation that we have seen over this period which is my second chart. So what does this all show? Well, if we use the onset of the global financial crisis in 2007 as the basis we can see that if you are a BRIC then your standard of living may have increased by between 5.1% (Russia) and 26.0% (India). 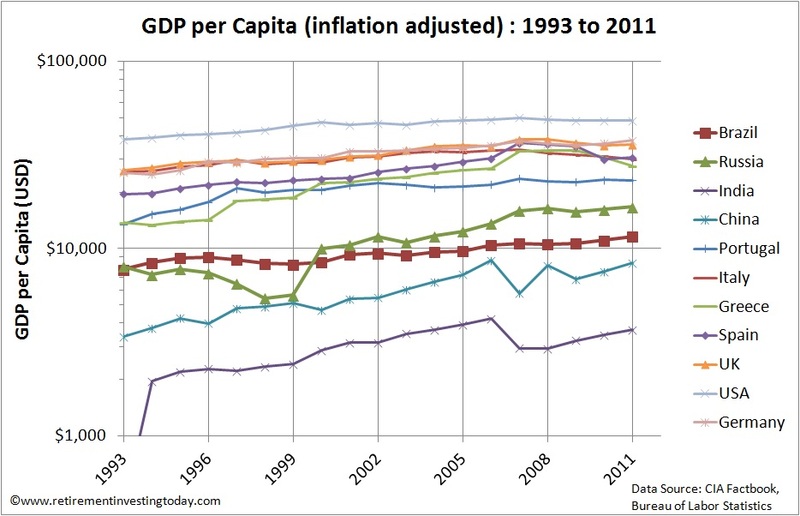 If you’re a PIGS then your standard of living may have declined by between -2.2% (Portugal) and -16.8% (Greece). Finally, if you are the US you may have seen a decline of -3.9%, the UK a decline of -6.5% and Germany a small increase of 1.3%. Focusing even further on the UK we can see that the loose correlation between GDP per capita and standard of living does indeed seem to hold true as we are certainly starting to see a fall with real earnings over the same period down 5% (http://www.retirementinvestingtoday.com/2012/06/uk-average-weekly-earnings-june-2012.html ). Finally, the key highlight for me from the second chart is that we are clearly still incredibly lucky in the west (whether a PIGS or someone in the UK). What this data set really highlights is the great discrepancies that still exist between the average standard of living (assuming a loose correlation with GDP per capita) enjoyed by people of different countries. If we are to truly live in a globalised world then surely there must be a convergence. 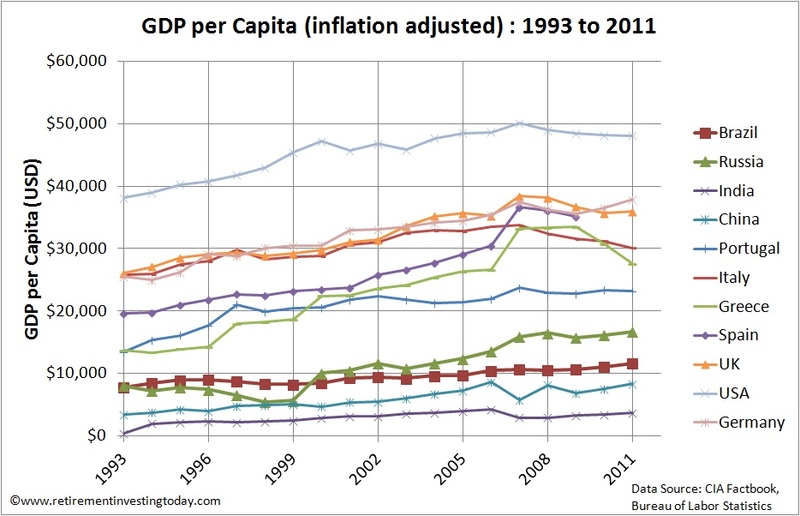 This does seem to be happening as in 2011 the ratio of the US GDP per capita to that of India was 13. In 2009 it was 15 and in 2000 it was 16.5. The BRIC countries still have a long way to go before they enjoy the standard of living of us in the west however the question is will the west continually decline until convergence or will the emerging countries rise to our level? I think the answer may be able to be seen in the data today. Update 10 July 2012: As requested by Paul I add a 3rd chart which is the 2nd chart shown on a log-linear scale. Nice bit of putting things in perspective. Trouble is "China catching up with UK" makes much better copy on SKY. It would be interesting, and maybe instructive, to see that second graph plotted on a log-linear scale. That should give a better picture of the rate of catch-up. I'm not near my dataset for the next few days however I'll try and add a log-linear scale in the very near future. I have however been thinking a little more about our previous discussion. I went back and found our original exchange. For the S&P 500 you came up with a real total return of 6.3% based on an annual trendline gradient and I came up with 6.5% using CAGR for the total period. It looks like we are amongst the noise with us being apart by about 3% however in the interest of perfection I'm actually wondering if we are at either end of the correct answer and need to merge our thoughts. 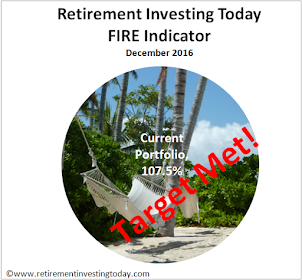 Let's assume a buy, hold, rebalance investor who is not extreme like me but is taking it seriously could probably build their retirement pot in say 20 years. 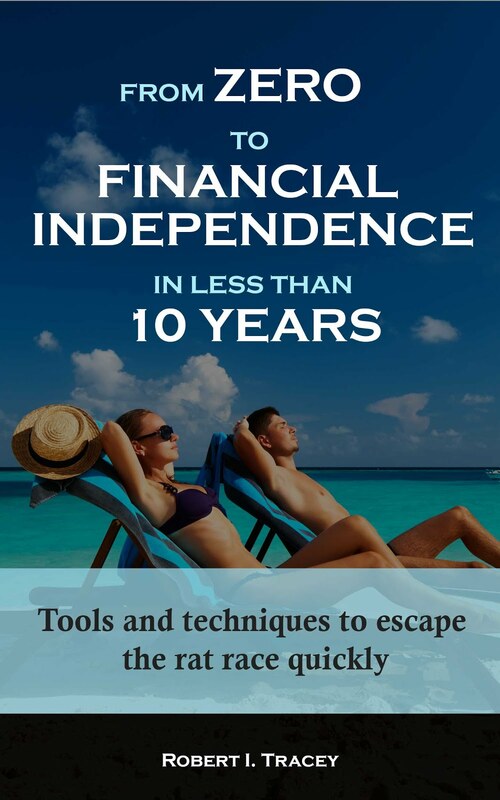 Therefore the "average" holding period for each investment would be around 10 years. Therefore should we be calculating a rolling CAGR based on a 10 year interval and then adding that to your chart for calculating the trendline? As requested I've added a 3rd chart which is the 2nd chart shown on a log-linear scale. I look forward to your comments. RIT, Thanks, that does show the faster rates of increase in the smaller economies nicely. On the CAGR one it is probably beaten to death. It was more an intellectual curiousity about the maths. Cheers.